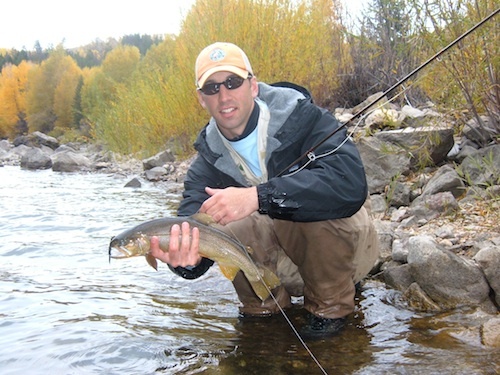 Editor’s note: The following is a guest essay written by Keith Curley, director of government affairs for Trout Unlimited. Learn more about the federal government’s proposed cuts to conservation programs and how your voice can be heard on nature.org. As spring makes its arrival, anglers across the country are getting ready to dust off their fishing rods and hit the water. Some 30 million anglers will fish in the U.S. this year, generating $42 billion in expenditures that help support local businesses and generate jobs. Sportsmen and women know that good hunting and fishing depends on two things: healthy fish and wildlife habitat, and public access. As long as we maintain abundant habitat and access, we can count on the economic benefits of hunting and fishing year after year, and secure our sporting heritage for ourselves and future generations. But this year a cloud hangs over our hunting and fishing future. HR 1, a bill passed by the U.S. House of Representatives to fund the federal government for the remainder of the fiscal year, went far beyond its initial purpose and became a grab bag of harmful legislative riders that undermine protections for the habitat that supports our nation’s fish and wildlife populations. One rider that hunters and anglers should be most concerned about strikes at the heart of the Clean Water Act. Recent Supreme Court decisions have resulted in the loss of Clean Water Act protection for at least 20 million acres of wetlands that are essential to waterfowl populations. The rider blocks the federal government from restoring lost protections for small streams, adjacent wetlands and geographically isolated waters that provide much of the habitat needed by fish and wildlife. These headwaters and wetlands are also the source of most of the water that flows through the nation’s waterways. Another rider blocks the implementation of travel management plans on National Forests. These plans have been painstakingly developed over the past several years to prevent the harmful impacts of unmanaged motorized access while working toward a safe, sustainable road and trail system. In developing travel management plans the Forest Service held numerous public meetings and gathered thousands of public comments. Blocking implementation of these travel management plans would undo this progress and squander all of the time and effort that went into development of these plans. HR 1’s funding provisions cut deeply into conservation programs. Funding cuts are to be expected in a time when our nation faces large deficits, but some of the proposed cuts make little sense. For example, HR 1 cut $393 million from the Land and Water Conservation Fund, a program that pays for itself through offshore oil and gas receipts. Using the Land and Water Conservation Fund to enhance habitat protections and recreational access helps to sustain hunting and fishing traditions and the outdoor economy. We as sportsmen and women are willing to shoulder our share of budget cuts, but we will cry foul when faced with disproportionate cuts and ill-conceived legislative riders which should not be on appropriations bills. If HR 1 were to become law, our nation’s rivers and streams and our sporting heritage would suffer, as would the local economies that depend on them. The nation deserves much better. The U.S. Congress has a duty to address our fiscal problems in a way that is worthy of the support of Americans who love the outdoors.